I bought a big bag of nuts – the kind you get at Sam’s or Costco – and then discovered to my dismay that I already had 2 bags in the freezer and no room for more. I decided I would try canning them – it didn’t look too difficult and I had the equipment and jars. I used directions from the National Center for Home Food Preservation that were available as recently as January, 2013. They then came out with the following information; Whatever happened to canning nutmeats? Apparently now we must not can our toasted nuts but place them in sterilized jars. We enjoyed our toasted nuts months later – already toasted and ready to put into Spring and Summer salads and other dishes. It's very convenient to have them already toasted before using. I now also store some half pints - 1 cup of nutmeats are frequently called for in recipes. Don't skip the toasting step - that removes the moisture from the nuts before they are canned so they don't mold. So – if you have leftover holiday nuts or just got a good buy on them, or have your own, here’s how to store them in jars following the new procedure. Step 1: Shell nuts if necessary. Spread a single layer of nut meats on baking pans and place in a preheated 250° oven. Stir occasionally heating only until the nut meats are dry but not browned. Watch carefully that they don't scorch. (It takes about 15-30 minutes for two 13x18” half sheets). Step 2: Allow them to cool at room temperature and simply put them in sterilized canning jars, covering with lids and ring bands. **Sterilizing jars provides extra protection against mold spores that could be on the jars. To sterilize jars, submerge them in boiling water for 10 minutes. Remove them from the water and sit them with open end down to allow them completely dry before filling with nuts. Another caution from the NCHFP: "Be aware that with any nuts, rancidity will eventually develop, making the product unappealing though not unsafe. Rancidity occurs in foods when fats or oils are exposed to oxygen over time, causing oxidation which leads to that yucky off-flavor. You might want to buy oxygen absorber packets to put in the jars. They will get rid of some of the oxygen, increasing their shelf-life." For those who want to know how nuts were canned prior to the warning in January of 2013 from the NCHFP, the directions are below for pressure canning. I personally do not recommend water-bath canning nuts because I think it would be easier to get moisture in your jars, although those directions were also included in "So Easy to Preserve"
Optional Step 2: Pack hot nuts into warm, dry half pint or pint jars leaving 1/2 inch headspace. Do not add any liquid to the jars. Wipe jar rims. Adjust lids and process. Use dry lids and jars. Process half pints or pints in a pressure canner for 10 minutes at 5 # pressure for 1000'. For pressure canner at higher altitudes above 1000' process at 10#. 9 Pint Jars "So Easy to Preserve"
Sue gave me a jar and she is right, so nice to just open them and they are toasted and ready to go.I am going to try this also as I have three large bags of pecans from Costco. I had no idea you could can nuts! Thanks so much for sharing this info. I appreciate it so much! Diane, feel free to link back to us on canning nuts. I didn't know you could do this either, until Sue did them. They keep well and I find they are a better flavor than the ones I freeze. I have heard of oven canning nuts, this is my introduction to water bath caning them. Oh, this sounds like a great solution to the old freezer problem of not enough space! I also did not know you could can nuts! Yay - that will leave more room in my freezer for other things! Thank you so much for this information! What a wonderful idea! I never even thought of this. Great information too. I always thought you had to cover jars with water in water canning in a regular pot. Thanks for posting. Could I can Almond flour? Almond flour is another product altogether. I guess if you think you need to can it, I would use the oven-canning method some folks use...I haven't oven canned; so I don't feel qualified to give advice on it. Oven canning really only seals your jars and may kill any insects that may be in the food. I usually refrigerate or freeze flours I think may get rancid before I use them, like cake flour. You can oven can nuts too. Any time i fire up my oven (for cooking dinner etc) I have a few cans of dried goods to put in after I take dinner out. It's worth a google! I've never tried water bath or pressure canning them, so I couldn't compare but I love my oven canned stuff! I guess I am not real comfortable with oven canning things. I freeze my flours, especially cake flour. I am with Sue in that oven canning only seals the jars and I would think it would affect the flavor of flours like Almond flour. I never thought to can nuts - what a great idea. Followed you from the Homestead Barn Hop. Love for you to come by Wildcrafting Wednesday and share. How long do canned nuts stay good for?? If you can them this way, they last for a year or two; perhaps longer, but I never have them that long. Do be sure you toast them first so they last as long as possible. It's an important step, and also makes them taste so good. I never realized that you could do this! I have to say I love your blog, I've learned so much from you both. So I have a question; Do you prepare the lids the usual way with warming them up in water to soften the sealing component? If so do you wipe the water off the lids to avoid getting water into the jars? Yes, I heated them and then wiped the water off. It seems to work well. I have canned nuts regularly, as we seem to use them up pretty fast. Do you think the nuts could also be spiced when toasted? How would you keep your spices on? You want your nuts to be dry when they are canned this way, or they will mold. This is a USDA recommended recipe - I might not want to mess with it. The only spiced nuts I have seen are not canned for long-term storage, just kept in an air-tight container or jar for a short while. With this recipe, they keep with pretty good quality for up to 2 years. If you just sprinkle them with spices I would think it would be ok; remembering that some spices get stronger when canned. 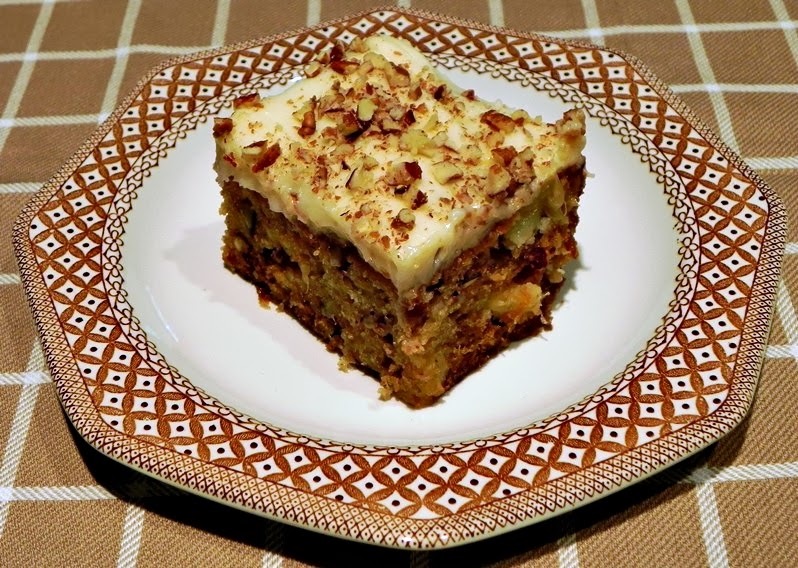 We like a plain recipe so they can be used in multiple ways - just more versatile. 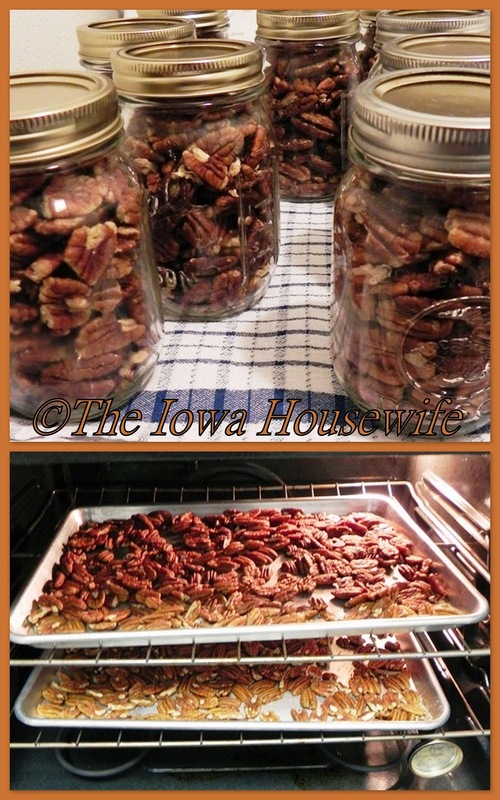 Has anyone processed their pecans/nuts in a food saver vacuumed jar? I'm wondering if this might be better than the oxygen absorber pacts but I don't have any personal experience to go by. We don't have experience with either method, maybe someone out there does and will share. When I can them, I try to use them in a year; until the holiday sales come around again. I have not used the new method now recommended, so I don't know how well they keep, if any longer than in bags they come in. I am wondering if I could can the roasted/spiced nuts you do in the oven/crockpot? Like the ones you get at the fair, you know? The would be toasted but coated with sugar/spices, candied you might say. Would they mold? I really don't know...the National Center for Home Food Preservation isn't recommending actually canning nuts anymore...and I don't like their new method...it doesn't really prevent rancidity, as they say in their warning. I can tell you, eating something that has mold on it, even if you can't see it, can make you pretty sick feeling! You'd probably be better off just making what you need and using them fairly quickly. I am going to agree with Sue, why take a chance. I make this type of nuts for Holiday treats and have kept them for at least three to four weeks without any problems. That is if I can keep them hidden. We just store them in fruit jars with lids and they are easy enough to make that I only make what we will eat in that length of tim,e.